Sanya is a popular tropical destination in China with average temps of around 25 deg C (77 deg F), making it a perfect spot for a lush garden hotel. 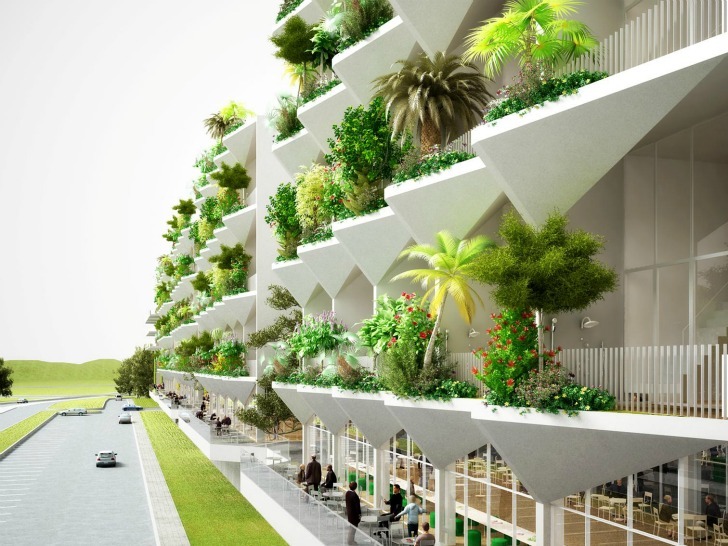 NL Architects has recently unveiled plans for a new hotel complex there that features a sculptural facade planted with tropical trees and vegetation in deep pocketed extrusions. Wastewater from inside the hotel rooms is used to water the plants, which also provide shade, cooler temps, and privacy. A maze-like 3D bridge system branches out from the central courtyard to access the rooms, and the ground floor serves as a public deck with restaurants, bars and retail spaces. Sanya Block 5 is a hotel that is part of a much larger tourist development which consists of 4 groups of mirrored buildings adding up to 8 in total. 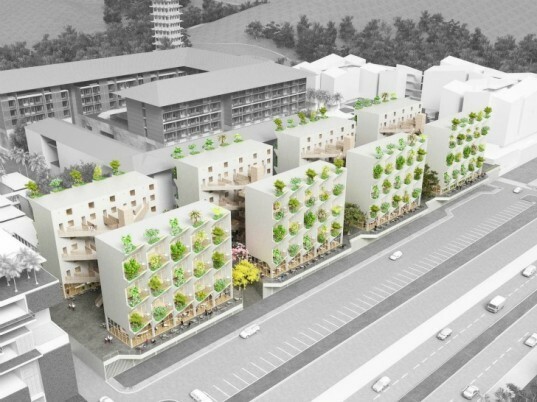 The exterior of the buildings feature large outdoor living spaces and deep-pocketed planters for trees and vegetation. This outdoor balcony serves as an extension of the indoor living space and a way to reduce conditioned space. Each hotel room includes two bedrooms, a kitchenette and a double height living area to let in more natural light and views. The vegetation on the balcony serves to provide shade and create a cooler microclimate for guests to enjoy. Wastewater from inside the room is used to help water the plants. The buildings are mirrored around an intricate 3D maze-like structure to access each individual room. This circulation strategy increases privacy for each room as compared to traditional gallery style hallways. The maze/bridge method creates a private catwalk route to each room. In between the buildings there is an open-air courtyard that serves as a lobby and public space where guests can mingle. Sanya Block 5 then becomes a lush retreat that places a strong focus on outdoor living as well as privacy for each guest. Sanya Block 5 is a hotel that is part of a much larger tourist development and consists of 4 groups of mirrored buildings adding up to 8 total. The exterior of the buildings feature large outdoor living spaces and deep-pocketed planters for large trees and vegetation. This outdoor balcony serves as an extension of the indoor living space and a way to reduce conditioned space. Each building features 15 hotel rooms for a total of 120 rooms. Each hotel room includes two bedrooms, a kitchenette and a double height living area to let in more natural light and views. The buildings are mirrored around an intricate 3D maze-like structure to access each individual room. This circulation strategy increases privacy for each room as compared to traditional gallery style hallways next to rooms. The maze/bridge method creates a private catwalk route to each room. In between the buildings there is an open-air courtyard that serves as a lobby and public space where guests can mingle. The vegetation on the balcony serves to provide shade and create a cooler microclimate for guests to enjoy. Wastewater from inside the room is used to help water the plants. Sanya Block 5 then becomes a lush retreat that places a strong focus on outdoor living as well as privacy for each guest. The trees and vegetation provide shade and privacy for the room but do not block views. Guests can cook, eat and relax on the terrace, which reduces conditioned space. Cross section of the hotel room.